If you are selling a house in Las Vegas, Nevada, then you are likely aware of the list of responsibilities that you have. In addition to the tasks that you must complete before the sale of your home can become final, there are also tools that can help you to increase your chances of selling your home quickly, in addition to making your entire experience as easy and as trouble-free as possible. One helpful tool that must not be forgotten during the selling process is the Seller’s Net Sheet. Although you will begin completing this sheet prior to selling your home, the Seller’s Net Sheet will be completed again after a buyer has made an offer on your home and you accept it. What is the Seller’s Net Sheet? This information is designed to help you determine what your how much money you propose to net from the sale. For instance, if your asking price for your home is $269,000 and you sell it for $265,000, you must subtract all of your related closings costs from the $265,000, and the amount that you’re left with is your net, or the amount that you actually make from the sale. If you are using a Las Vegas Real Estate agent to assist you with selling your home, then either your real estate agent or the title company will develop an accurate and helpful Seller’s Net Sheet for you, which will make planning easier for you. Projected closing date – This, or course, is the date that you, the buyer, and everyone else involved must meet in order to sign paperwork and finalize the sale of the house. If the closing date changes, so might some of the pro-rated costs on the net sheet. Selling price – This is the actual price that your home is selling for. This may or may not be different from the asking price of your home. Real estate commission amounts – When you chose your Las Vegas real estate agent, you agreed that he or she would be paid a certain amount to assist you with the sale of your home. This line contains the amount of commission that your agent will be paid. It must be subtracted from the selling price of your home. This amount might be a percentage of the actual sale, or a predetermined amount. You may see it broken down as to compensation to both the buyers broker and your agent since the seller typically pays the total commission in Nevada. Cost of title insurance – Most mortgage companies will require you to purchase title insurance, which protects the mortgage company in case the buyer fails to pay off the home as agreed. 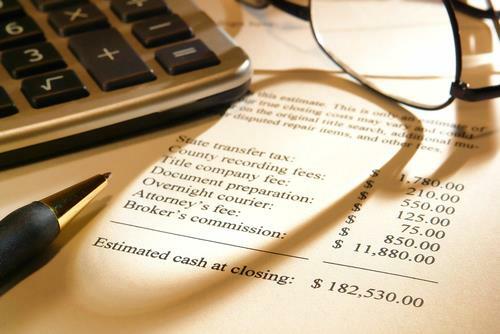 You will need to find out how much your title insurance is, which will be listed on this line. This amount must also be subtracted from the selling price of your home. Various fees – There may have been many fees associated with selling your home. These fees can include escrow, transfer, purchase of home warranty for the buyer, and any number of other miscellaneous amounts. You can obtain this amount from the title company, and this total will appear on this line. You will also subtract this total amount from the selling price of the house. Property taxes – You will need to obtain a copy of the Nevada property taxes for the home. If the taxes have been paid to date, then you will only have to pay them as of the proposed closing date. If you owe back taxes, this must be paid by closing, and you will subtract this amount from the price that the home sold for, as well. Mortgage pay-off– You will need to contact your mortgage company to find out what your loan pay-off amount is. This amount must also be subtracted. Net – This final number will be the amount that you are left with after the sale has been finalized. Of course if you agreed to pay a portion or all of the buyers’ closing costs, then you must not forget to calculate that amount, as well. If you have an agent, then he or she will provide this figure for you. Hopefully your net will be what you expected and what was proposed on the net sheet, if not more. Sometimes an actual net amount is in the negative and a seller actually loses money. However, Las Vegas house values have recently increased, which is good for sellers. This increases your chances of making an acceptable profit from the sale of your home. This will depend on several factors, such as the shape your home is in, how much equity your home has, and more. According to Lori Ballen, from The Ballen Group Las Vegas Real Estate Agents with Keller Williams Realty Las Vegas, estimated house value for Las Vegas home sales have increased to the $200,000 range as of early 2014, and they continue to rise. Many sellers feel this increase in property value has made a major difference in the offers they are receiving. As you can see, a Seller’s Net Sheet is a very handy and convenient tool that can help you estimate how much money you can expect to be able to pocket after the sale of your home is complete. Without a Seller’s Net Sheet, you will have no way of planning in advance, as you will have no idea how much you’re actually paying and for what. The net sheet will be provided to you by your real estate agent, or in some cases, the title company. He or she will prepare one for you at the time that your home is listed for sale. You will be presented with a second and updated net sheet after you have actually accepted an offer from a perspective buyer. Hopefully your net sheet will be as accurate as possible and enable you to make plans with the final amount that you make from the sale of your home. Disclaimer: The information provided in this article is not intended to be substituted for legal advice. We are unable to in any way guarantee that your house will sell for a specific price, and this information is provided to you simply as a guide. Actual sale prices might differ substantially from what is proposed on your Seller’s Net Sheet, and will vary from area to area.